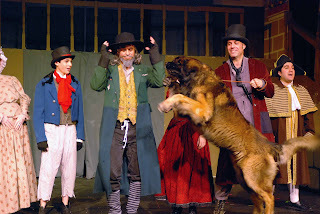 On 6/5/11 the last performance of Oliver Twist was performed. Chewee was a magnificent "Bullseye". He received a standing ovation from the audience and everyone cheered at his fantastic performance. The audiences gasps were heard when he leaped into the air twice in the scene, when Bill Sykes was killing Nancy. Oliver, played by Noah worked together with Chewee to create a true magical stage moment when they had to cling together on stage. Chewee loved working with all the actors and he had a special bond with all of them. At the cast party, the producer had wonderful things to say about him and said he looked forward to working with him again. It was a very exciting night.